Earlier today, we first spotted Twitter’s new name search results feature on twitter.com. At first glance, it looks to be a brilliant tool for new user discovery — especially among celebrities whose names will be searched for often. But is it more? Marshall Kirkpatrick at ReadWriteWeb wondered that this evening, asking “Is This How Twitter Will Offer Friends For Sale?” The answer is no — not right now, anyway. I suspect Garrett’s last comment was mostly made in jest. My sense is that this is a feature Twitter has been working on simply to make user discovery a bit easier. But Kirkpatrick’s point on how the feature can be used to make money is an interesting one. 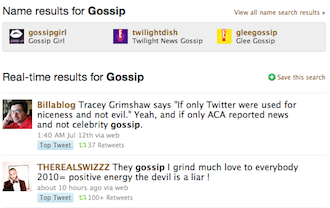 For example, if you search on Twitter for “Hollywood gossip,” perhaps a user could bid to buy the rights to be a featured user near that search term — similar to the way Google AdSense works for Google Search keywords. “I think people have assumed that Twitter would monetize search with ads the way Google has – by inserting links to destinations. Twitter is people though – so it makes sense to monetize connection to people and to brands,” Kirkpatrick writes. This all stems from a MediaMemo report earlier this month that Twitter was considering allowing users to pay to be featured in some way to attract more followers. Garrett was coy when asked about that idea as well, basically saying that all options are on the table. One thing for certain is that Twitter has a lot of options in front of it now for ways to potentially make money going forward. Of course, “potentially” is not “actually” — the company still has to execute and choose the methods that strike the right balance of money-making and user happiness. The last thing anyone wants is for Twitter to be overrun by SEO spam.